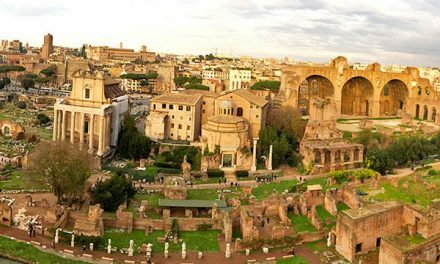 The Arch of Titus is located inside the archaeological area of the Roman Forum along the so-called Via Sacra. 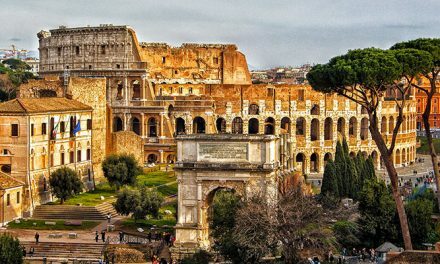 The triumphal arch, which was erected by Emperor Domitian in 82 A.D, commemorated the victories of his father Vespasian and his brother Titus in the Jewish War in 70 A.D. 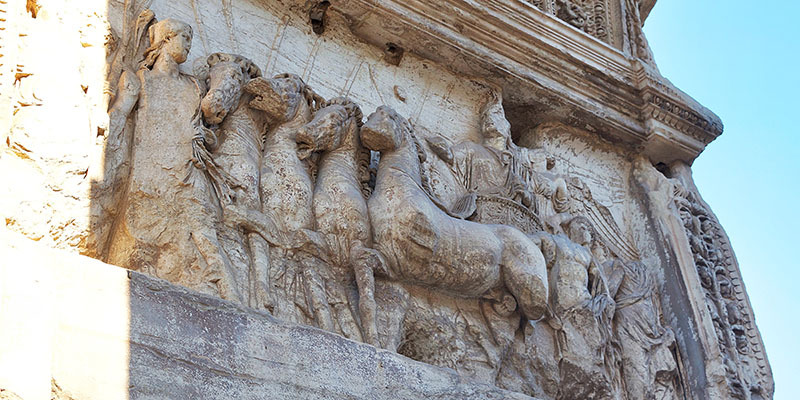 The base-reliefs on the Arch of Titus show scenes from the sack of Jerusalem, when the great city and its temple were completely destroyed. 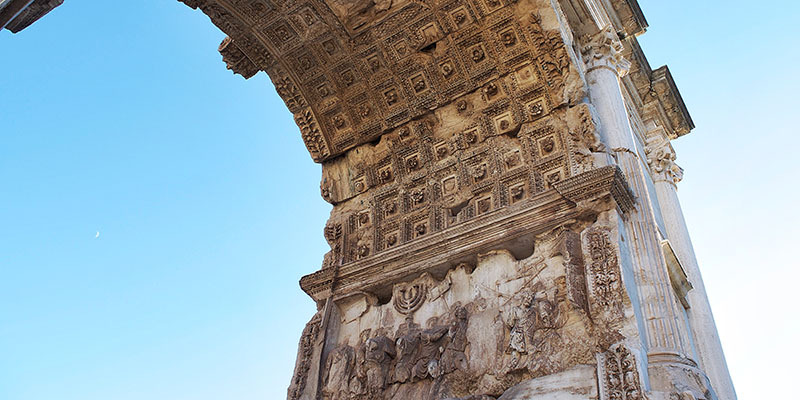 The use of the word ‘Divo’ means that the arch was erected after Titus’ death, which indeed occurred in 81 A.D.
Two episodes of Titus’ triumph over Jerusalem are depicted on the inner side of the arch. The panel on the South shows Titus’s triumphal march as it passes through the Porta Triumphalis bearing the precious spoils of Solomon’s Temple. Looking at the bas-reliefs you can see pretty clearly the door on the right and also the menorah, the seven-branched candelabrum, and one of the oldest symbols of the Jewish faith. On the opposite side you can admire another panel, depicting the key moment of the celebration: Titus riding a four-horse chariot, called quadriga and being crowned by a personification of Victory. In front of him stands the goddess Roma. The two other figures on the right of the chariot are personifications of the people of Rome and the Senate (wearing the toga). In the center of the vault you can see another representation of Titus riding an eagle that is carrying him up to the sky. The victory of the Roman legions led by Titus is probably one of darkest chapter in the history of Jerusalem. According to legend the Temple of Solomon was completely sacked of its precious treasures. Among those treasures there was the famous “Menorah”. However, no one knows where these treasures ended up, since they were actually never founded. 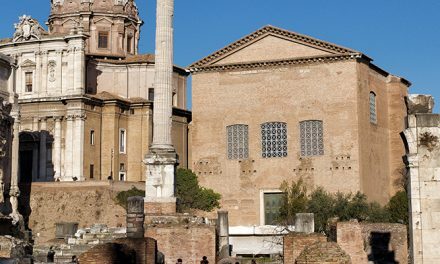 According to legend the menorah vanished in the water of the Tiber River along with other precious objetcs. 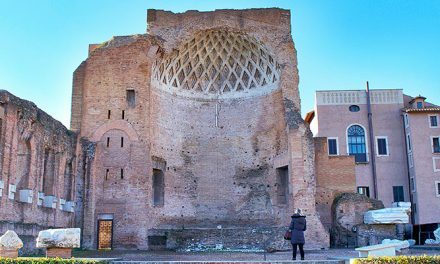 Some sources say it fell down from Ponte Fabricio by accident, while other say that Gregory Magno threw the menorah in the Tiber River on purpose to take it away from the barbarians. 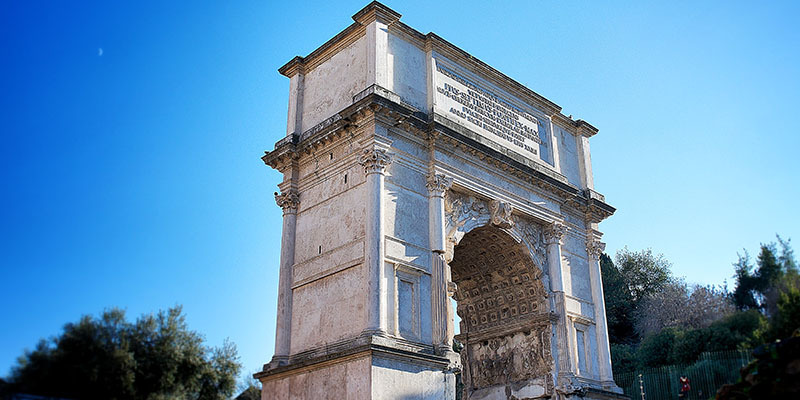 In 1821 the arch was restored by the architect Giuseppe Valadier, who added new inscriptions and a dark travertine to differentiate between the original and the restored portions.